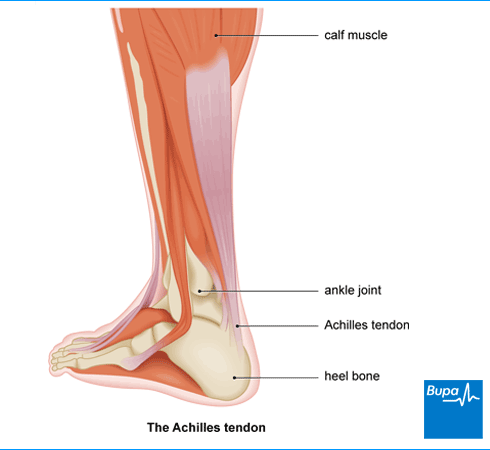 An Achilles tendon rupture is a tear of the tendon that connects your calf muscle to your heel bone. You can either completely or partly tear your Achilles tendon. Tendons are strong and flexible tissues that connect muscles to other parts of your body, usually bones. Your Achilles tendon is the strongest tendon in your body. Although anyone can rupture their Achilles tendon at any age, most ruptures happen to people aged 30–50 who are exercising or playing sport. This includes professional athletes. Men are more likely to rupture their Achilles tendon than women. If you have any of these symptoms and think you’ve ruptured your Achilles tendon, you should see a doctor urgently. This is because a ruptured Achilles tendon needs treating straight away. If you cannot get to your GP immediately, you should go to accident and emergency at your nearest hospital. Your doctor will ask you about your symptoms and how you think the injury happened. They’ll examine your leg, heel and ankle and may squeeze your calf muscle to check the movement of your foot. Your doctor may also ask you to do some movements or exercises to see how well you can move your lower leg. The treatment you’ll need depends on your age, your general health and how active you are. Different doctors treat a ruptured Achilles tendon in slightly different ways, so ask your doctor for clear information and instructions about your treatment. Whatever treatment you have, you’ll need to wear a brace or cast. You may also be asked not put weight through your leg and onto your foot for a few weeks. This is called being non-weight bearing. Your doctor will tell you if you need to do this and, if so, for how long. Non-surgical treatment often starts with a cast on your leg for two weeks, followed by a brace for another four weeks. The cast is usually from your knee downwards and is put on with your foot in a fully bent downwards position. Usually you’ll be asked to put very little weight through your leg while the cast is on, but once the brace is on you may be able to put weight through it. You’ll need to walk with crutches. The brace is a rigid type of boot with straps to adjust it that usually goes from your knee downwards. Once the brace is put on, it will be adjusted several times over a few weeks to bring your foot up. You’ll probably be asked to wear the brace all the time, including when you’re asleep. While the brace is on, and when it comes off, a physiotherapist may give you specific exercises to do. These might include keeping your toes moving along with exercises for your knee and hip to stop them getting stiff. Exercises can help to strengthen your calf muscle, help you to begin walking again properly, and reduce your chances of the tendon rupturing again. If you need pain relief while your tendon heals, you can take over-the-counter painkillers such as paracetamol or ibuprofen. Always read the patient information leaflet that comes with your medicine. If you have any questions, ask your pharmacist for advice. This treatment usually works well. It can be a good option for you if you’re older or not very active. Compared to surgery, non-surgical treatment has less chance of complications but there is a greater chance of another rupture in the future. Ask your doctor which treatment is best for you. Your surgeon will stitch your Achilles tendon together using the strongest possible sutures, so it can heal well. Having surgery rather than non-surgical treatment means the tendon is less likely to rupture again. But with surgery there is a chance of complications, including that the wound may become infected or scar tissue may develop. Ask your surgeon to explain the different options so you can decide what’s best for you. After your operation, you’ll need to wear a cast or an adjustable brace on your leg to help the tendon heal. At the same time, you can start to gently exercise it. Doing the exercises and slowly starting to get around helps to give you the best chance of a full recovery. As part of your treatment, you’ll need to gradually increase your activity to strengthen your Achilles tendon. You’ll need to do some physiotherapy too. For example, you’ll need exercises to increase the range of movement and strength in your lower leg. You’ll start with gentle exercises and build these up over time. Once the tendon has healed (usually after 8–12 weeks), you may need to do progressive calf-strengthening exercises. Your physiotherapist or doctor will give you advice on how long it will take to get back to playing sport or doing regular activity. Many people get back to jogging and non-contact sports about four or five months after the rupture. If you play a contact sport, then it will probably take longer to get back to playing. For some people, getting back to regular activity may take longer. Some athletes find they’re unable to return to the same level of activity as before. Depending on your type of job, you may need to take time off work to allow the tendon to heal. Most people will be off work for between four and eight weeks. If you’re based in an office and sitting for most of the time you may be able to go back to work sooner, using a cast and crutches or a brace. If you do a job where you’re on your feet and active, it’s likely to be longer. Your doctor will be able to give you specific advice. You may be able to reduce your risk of injuring your Achilles tendon by making sure you warm up well before you exercise. But experts are not all convinced that warming-up does help to reduce this risk. However, there is evidence to support the importance of stretching if you’re doing a new activity or sport or exercising at an intense level. Will I have to give up sport after a rupture? Will I have to give up sport after a rupture? Many people fully recover and can return to running or other sports after an Achilles tendon rupture. It can take some time to become fully fit though and to get back to the same level of fitness you had before the rupture. Athletes may need a year to return to their full activities and some are never able to get back to their previous level of fitness. The period of time resting, healing the tendon and being out of training can affect your muscle strength and the way you walk. These factors as well as the ruptured tendon can affect how well you recover. Achilles tendinopathy is injury to the band of tissue (tendon) that runs down the back of your lower leg to your heel. Physiotherapy is a treatment that aims to improve the way your joints and muscles work.